Show your SIS Information Warrior pride and support student scholarships! With a new SIS tee shirt, you can do both! 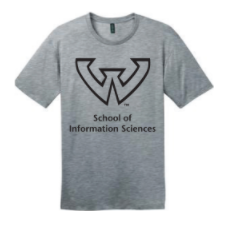 The Wayne State University School of Information Sciences has announced a digital pop-up shop to celebrate the new school name and support student scholarships. The shop is open until September 15 and features three tee shirt styles with the new SIS logo on the front and the words "Information Warrior" on the back. Proceeds from the sale of the tee shirts benefit SIS student scholarships. Shirts are expected to be delivered two to three weeks after the pop-up shop closes. Visit the shop and show your SIS pride today!